I recently came across an article Not In Chains, which was written by Doug McLean in the Spring 2006 edition of The Author. …the responsibility for what stocks the nation’s bookshops will be in the hands of a few head office buyers who, by nature, are far removed from the eventual customer. There will be little room to experiment with new authors, and small independent publishers and the public will see but a fraction of the wide variety of books that existed when independent bookshops were plentiful. The book-reading public is becoming more aware that independent bookshops are places where they can interact with the staff, who often know, or take the trouble to learn their names and their favourite choices in reading. The independent, as second nature, holds knowledge of its customers that supermarkets and chains spend hundreds of thousands of pounds attempting to capture electronically. At the Cheltenham Festival of Literature, Alan Bennet, to enthusiastic applause, urged his 1,000 strong audience to return to independent bookshops. McLean goes on to say that the independent bookshops need more Alan Bennets and others of influence to educate the public on the real cultural value of independent booksellers, not least as guardians of English literature. The Arts Council, large publishers, independent publishers, authors, librarians, printers, educators, and indeed everybody have a vested interest in promoting the survival of the independent bookshop. And he ends his article. 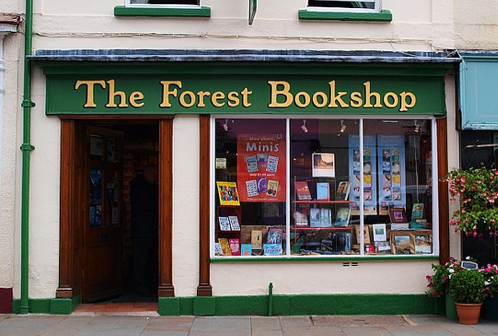 Doug McLean owns an independent bookshop in Gloucestershire, the Forest bookshop which he started in 1976. Like many other surviving independents he has also developed a thriving niche, specialising in sign language and deaf issues.